Thanks to all those who braved the post Christmas lethargy to join the December 2013 MMSF “Turkey Shoot” at The Winner’s Circle and Air Soft Special Ops in Salisbury, MA last Friday night. The night’s esteemed winners are shown below, and there are even more pictures from the evening here (courtesy of Marie Hanabusa). Our next MMSF “Turkey Shoot” of pool, darts, and pistols will be on January 31st, 2014. You can find out more about the event, and buy your tickets now! 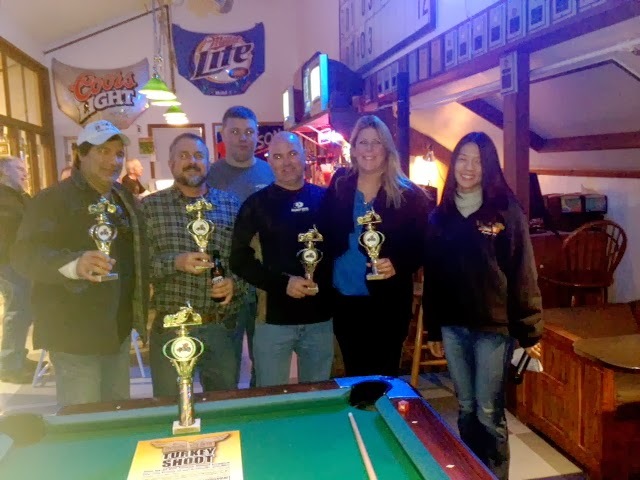 This entry was posted in Events, Photos, Supporters and tagged air soft special ops, darts, marie hanabusa, pistols, pool, salisbury, turkey shoot, winners circle on December 30, 2013 by mmsf. Riders Helping Riders on TV and online! Danvers Community Access Television was kind enough to invite Massachusetts Motorcyclists’ Survivors Fund Board members Paul Cote and Carol Richardson for twenty five minute interview segment called ‘Significant’ with host Charlie Vogel. You can watch it online, watch it below, or find your local channel listings at www.danverstv.org. This entry was posted in Awareness, Supporters and tagged carol richardson, dcat, interviews, mmsf, on tv, online, paul cote, press on December 22, 2013 by mmsf. Please stop by our booth on January 11th – 12th for the Northeast Motorcycle Expo in Boston. (All the event details, directions, and show hours are here.) When you stop by and say hello, get information about the 15th Annual Nelson’s Ride on August 17th, 2014, and buy a 2014 Survivor’s Fund Raffle Ticket for only $5, you’ll get a free ‘Check Twice‘ sticker! Make sure to check out www.kevmarv.com for upcoming show in Salem, NH in February 2014, and in Wilmington, MA in March 2014. And…print out the coupon below and get $2 off your ticket fee for the January show in Boston!! This entry was posted in Events, Raffle, Supporters and tagged kevmarv, mmsf, nelson's ride, northeast motorcycle expo, raffle on December 12, 2013 by mmsf.